Hackney Ladish, Inc. has always been dedicated to being the premiere quality supplier of steel buttwelding fittings. Since Hackney Ladish, Inc. supplies fittings to every major market, quality has always been a concern that is taken seriously throughout the organization. Since a change in ownership, Hackney Ladish, Inc. has been committed to being the best fitting manufacturer with high fill rates, backorder filling, the largest selection of product sizes and types and highest quality. To that end, Hackney Ladish, Inc. has recently been audited and approved to the ISO Quality Standard, ISO 9001-2008. 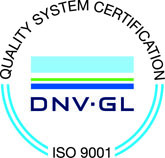 In addition to ISO certification, Hackney Ladish, Inc. has also been approved by DNV, who is recognized worldwide for their capabilities in meeting the world’s quality system auditing requirements.